Don’t you just love a true ski trail? Trails with character, carved out of the mountain’s canvas that twist and turn, and reveal a spectacular view around each corner are the best. Give me reverse fall lines, knolls and variations during my vertical descent. This may sounds old school, but it’s far more interesting than wide-open groomed boulevard with homogeneous cord. Narrower trails lined with trees – snow ghosted pines and shimmering birches, are prettier and offer protected snow. See also The Most Difficult Ski Trails in New England and New England’s Most Scenic Ski Trails. 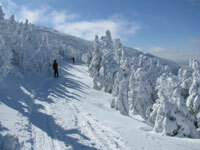 Here are some beautiful ski trails, unique and exceptional skiing in New England. 1. Pole Cat at Wildcat in Jackson, New Hampshire saunters down the full 2,000’ vertical, while giving you the sensation that you can reach out and touch Mount Washington’s eastern flank. The view into Tuckerman’s Ravine is unrivaled, especially on a sunny March day when you are riding laps on the high speed Wildcat Express, and hikers are huffing up Tuck’s for their turns. 2. Jester at Sugarbush is one of the prettier ski trails in the beautiful Green Mountain State of Vermont. From Heaven’s Gate 3,975’ atop Lincoln Peak, you saunter down playful Jester with a few twists and turns – with heavenly Mad River Valley views below. Sugarbush’s Castlerock trails are awesome as well, but these double-black diamond drops are not groomed, not for everyone. 3. Goat at Stowe, Vermont, is a heart-thumping, narrow, precipitous run with serious vertical drop. This trail, along with the very steep Starr, are outstanding adventures, part of Stowe’s famous Front Four. You can’t see the beginning to end, which makes it even more daunting. National and Nose Dive, also steep and scenic, have been altered and widened, taming their wild side. 4. 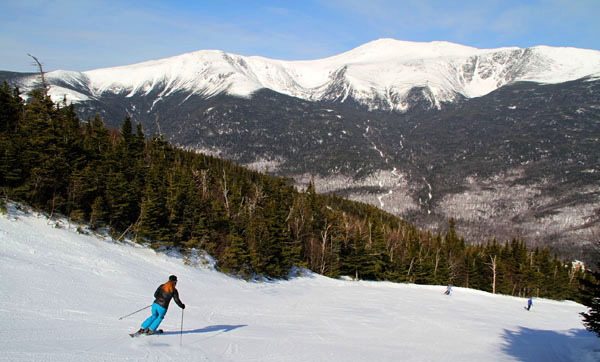 Muleskinner at Saddleback, Maine makes the list for old fashioned ski trail appeal. The traverse (or hike for snowboarders) out to this narrow twisty trail takes you back in time, and out into the woods as you pass the glades of Casablanca. Muleskinner is not groomed, instead it is gritty and untamed, with wonderful views of the Rangeley Lakes region. 5. Binder to Double Bitter at Sugarloaf, Maine starts with the eye-popping panorama, from the 4,237’ summit, winding its way down on a relatively narrow trail to Double Bitter with its fun banked turns and twists. It does deposit you at Stomping Ground Terrain Park, but you can bail to Candy Side or Peavy’s XCut over to Sidewinder to escape the jibbers, jumps and kickers. 6. Upper Ravine at Cannon Mountain in New Hampshire starts from the highest lift serviced elevation in New Hampshire at 4,080’. 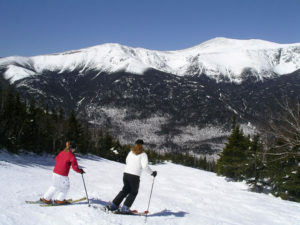 Skiers left from the magnificent summit, next to the legendary Taft Slalom trail, Ravine cruises down Cannon with great views of Franconia Notch. 7. Chilcoot and Drifter at Smugglers Notch in Vermont turn the skier and rider in every angle while descending Madonna Mountain. Skier’s right is Drifter, you can peek across the Notch at Stowe’s Front Four and the impressive 4,395’ Mount Mansfield. From Chilcoot, skier’s left, you can see Lake Champlain and the stately Adirondacks, even as far as Canada on a clear day. 8. Shockwave at Maine’s Sunday River gets my vote as a cool trail. Neighboring White Heat earns all the accolades (longest, steepest, widest in the East), but Shockwave is a little steeper, with a few drops and twists after a beautiful entry overlooking the Bethel valley toward Mt Abram. Shockwave is not an exhibitionist trail to those riding the quad like sister White Heat, so you ski it purely for your own exhilaration. 9. Flying Fox at Loon in New Hampshire is a personal fave of mine. 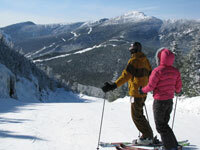 Its starts with sweeping views as you depart the Gondola and head toward this fun, flirtatious run. Perhaps I have an affinity for Flying Fox and neighboring Picked Rock as I skied here with my Dad, and he would stash beers behind the big boulder to enjoy later on gorgeous spring ski days at Loon. The challenge was to find them in the snow later. 10. Crawford’s Blaze at Bretton Woods offers a perfectly framed view of “The Mount” along with a fun curvy descent through delightful trees along the way. Herb’s Secret and Granny’s Grit are gems too. Take the chair back up to Latitude 44 for a scenic lunch looking at Mount Washington and the grand 1902 Hotel.